This photograph is an open edition print, professionally printed for you with a luster finish on premium acid-free photographic paper that will resist fading for generations in typical home display. It will be carefully shipped in sturdy moisture-resistant packaging. Your photo will be a high resolution, fine art print. It has been adjusted here for web viewing. Images will be adjusted slightly due to the different proportions. The watermark will not appear on your photograph. Printed colors may vary slightly from those viewed on your monitor. The images of framed photos are only examples to demonstrate how the print might look matted and framed. They are not to scale. Please keep in mind that the effect of this photograph on your wall will depend on the size of print you order, your room dimensions and your furniture. 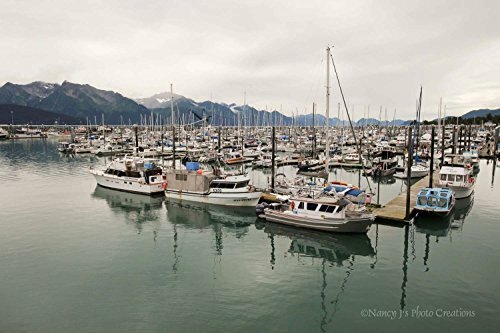 You can find this image on canvas and in other variations by searching Amazon for 'Nancy J's Photo Creations boat'. Gift wrap is available for prints up to, and including, 11 x 14". Ribbons may vary. To browse through all my photographs, click on the circular image of my face (on the right side of this page) and then click on, "See all" (found on the right side of that page). If you have any questions about this product by Nancy J's Photo Creations, contact us by completing and submitting the form below. If you are looking for a specif part number, please include it with your message.